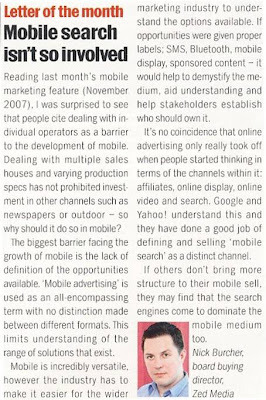 Revolution Magazine published my letter about mobile marketing - and made it letter of the month! "Reading last month's mobile marketing feature (November 2007), I was surprised to see that people cite dealing with individual operators as a barrier to the development of mobile. Dealng with multiple sales houses and varying production specs has not prohibited investment in other channels such as newspapers or outdoor - so why should it do so in mobile? The biggest barrier facing the growth of mobile is the lack of definition of the opportunities available. 'Mobile advertising' is used as an all-encompassing term with no distinction made between different formats. This limits understanding of the range of solutions that exist. Mobile is incredibly versatile, however the industry has to make it easier for the wider marketing industry to understand the options available. If opportunities were given proper labels; SMS, Bluetooth, mobile display, sponsored content - it would help demystify the medium, aid understanding and help stakeholders establish who should own it. It's no coincidence that online advertising only really took off when people started thinking in terms of the channels within it: affiliates, online display, online video and Search. Google and Yahoo! 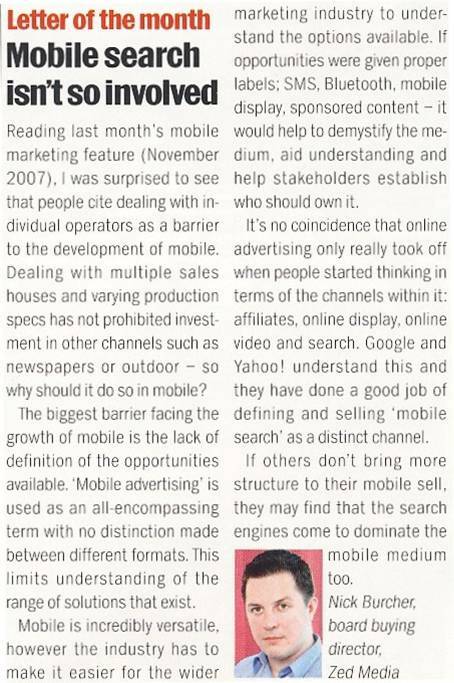 understand this and they have done a good job of selling 'mobile search' as a distinct channel. If others don't bring more structure to their mobile sell, they may find that the Search Engines come to dominate the mobile medium too." writes Nick Burcher, Board Director, Zed Media.